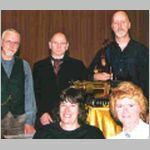 Come along to a night with a difference, Pepper’s Ghost are a magic lantern show using an original 1890 brass and mahogany lantern. The whole evening is given over to nostalgia (“What’s different ”) I hear you ask? The glass plate’s slides are usually themed and you will get plenty of opportunity to join in as they come with music and song from this four-piece group. We have waited a long time to get this group back.